If you are a guitarist, then you already know what a guitar pick is. 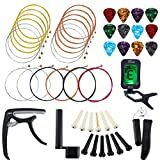 If you are just beginning to play the instrument, then you may wonder why guitarists use these tools, what they are for, and whether you need to use one. A guitar pick, or plectrum, is a small, thin piece of hard material used to pluck the strings of a guitar. In principle, it is not necessary to use a pick to play (and very many players do not), but for a lot of guitarists it is an essential part of the instrument. This small piece of accessory is nothing new, in fact, it has been around for centuries, and there are even discoveries of silver plectrums, found in recent archeologic researches in Asia. Playing with a pick allows you to control the attack of the instrument — how the sound is produced — in ways that using your fingers does not. It also, for most of us, allows us to play with more speed and accuracy. Playing with a pick involves an entirely different set of techniques than playing with your fingers — or what is called playing “fingerstyle.” This article, however, is not about those techniques. What I am going to discuss is the very basic way that we connect to our picks (and thus to our instruments): how we hold the pick. Choosing a way to play your chords and picks, whether you are using a guitar pick or not, is entirely linked to your own playing style. And there are great guitars for beginners that are versatile enough to allow you to try everything you want before going for a set way to play. Do you have to use a pick? One question that you may have is whether, to begin with, you need to use a pick at all. You have likely seen some of your favorite guitarists carrying on without them all together — playing with their fingers. Though there are many ways to play a guitar, there are two basic approaches to picking (which each have many variations): fingerpicking and flatpicking. Flatpickers use a pick, whereas fingerpickers do not (they use their fingers). Flatpickers sometimes also use thumb or finger picks to play (these picks attach to the thumb and fingers of the picking hand to change the attack of the picked note and help players do things they might otherwise not be able to do). There is a third way of playing, sometimes called hybrid picking, in which a player uses a flatpick or a thumb pick and combines techniques of both flatpicking and fingerpicking. This, however, is a far less common way of playing. If you still feel unsure, you can go deeper into this topic. Reading this study you will get to know how using a plectrum or guitar pick, and the accessory’s thickness can place a relevant difference in the sound output of your guitar. In general, the benefit of flatpicking is increased dexterity. Picks also change the tone and volume of the note produced, and this can be desirable. For many players, it is possible to play single note lines with a pick that would be extremely difficult or impossible without one. One example of this is the way that some players use picks to “sweep” across the strings in order to play arpeggios. For fingerpickers, however, there is a good reason to ditch the pick. It is far easier to play certain chord voicings, certain cross-string patterns, and to play multiple parts at once (for instance, a bass line and a melody line). So the short answer to the initial question is — no, it is not necessary to use a pick; but there are certain things that you may want to do with your instrument that you can really only do with a pick (in most cases). The rest of this article will assume that you are a flatpicker, at least some of the time, and will help you to understand the most basic thing about playing with a pick — how to hold it. Is it important how you hold a pick? If you have decided that you are going to use a pick, at least some of the time, then you may be tempted to simply grab ahold of it and play — leaving the way you hold it to your natural inclinations. This may not seem like a bad idea, and in principle it is not. However, the way that you hold your pick is important, and it will affect how you play and how easily it will be to do certain things (not to mention how your guitar will sound in the end). The feel of your instrument. How you hold your pick will determine how you are connected to your guitar. This means that different ways of holding your pick will give you different ways of feeling out your instrument. Each of these ways of connecting to your guitar with your right hand will affect how you play, from the notes that you choose to the way that you play those notes. Your technique. Holding your pick in different ways affects the way you physically play the instrument. For that reason, it will alter the techniques that you can execute easily. There is a reason that players who play fast staccato lines tend to hold their picks in certain ways, whereas players who do a lot of sweep picking tend to hold their picks in other ways. The tone of your instrument. This is especially evident on acoustic guitars, but it is also true of any guitar with any amount of distortion or processing. Holding your pick in different ways encourages you to strike the string in different ways. This produces different effects on the string itself, which alters the tone of the instrument. Playing, for instance, deep into your pick will sound louder and clearer than playing closer to the edge of the pick — and this is largely determined by how you are holding the pick with respect to the strings that you are striking. How many ways are there to hold a pick? In truth, there are as many ways to hold a pick as there are players who hold them. It is possible to prescribe one or two different ways that you think are the “best,” but this is ultimately dishonest — great players make great music holding the pick in a number of different ways. In general, picks are held with two fingers — the thumb and pointer finger. They are generally held between these fingers with the pick positioned so that one side is pressed against the flat, fleshy part of the thumb and the other is pressed against the side of the pointer finger. In this way, the point of the pick usually points out the side of the thumb, perpendicular to it. It is possible, however, to have the point facing more toward the end of the thumb, which is not uncommon among very fast pickers. Some players hold their pick with three fingers — the thumb, pointer, and middle fingers. This is generally not advised since it makes it harder to manipulate the pick quickly and accurately, but it does provide a steady, firm, anchored grip that some players prefer. One notable player is Eddie Van Halen. An alternative to choking up on the pick is to choke further back on it, allowing more of the pick to stick out from your fingers. This encourages a louder, stronger, clearer, and deeper pick stroke against the string. While it is sometimes harder to play with speed and accuracy when you use more of the pick to strike the string, some players prefer doing this because it adds to the overall volume and clarity of the music. It is easy to tell players who use more of their pick on the string apart because the notes, even during fast sequences, sound louder and clearer — almost as though each is encased in their own envelope. Many country, bluegrass, and jazz pickers use this technique or a similar technique. The way that you hold the pick will in part determine how it is oriented with respect to the strings and neck. One way of holding the pick encourages it to be angled in, toward the neck and away from the back of the guitar. This is one way of changing the attack of the pick on the strings. Angling the pick in either direction helps to make sure that part of the side of the pick is used to strike the string (and that the tip is not the only thing hitting the string). Whether you are choking up or choking back on the pick, this helps to soften the sound of the pick because it makes the striking surface longer and rounder. Some pickers who want to angle their pick choose to angle it away from the neck rather than toward it. This can be awkward for many players, but it can be useful. If the pick is sufficiently angled, then it will have a similar effect of angling it toward the neck. If, however, the pick is only angled slightly, then it will actually accentuate the pick tip’s effect on the strings, making the sound sharper. It is customary among country and bluegrass flatpickers to hold the pick so that it is perfectly flat on the strings — meaning not only that it is not angled in either direction, but that it is also not twisted in any way. This means that the full force of the pick’s tip is incurred on the string. Playing this way can be quite difficult, but it encourages a clear, direct, loud tone that is often associated with the great flatpickers in bluegrass, country, and jazz. It is quite different than the sound associated with fast rock or neoclassical guitarists, who tend to angle, twist, and tilt their picks. Many players find it useful to twist their picks with respect to the string. This allows the pick to cut or slice across the string, decreasing string drag and resistance. In theory, this makes it easier to play the instrument, allowing the picker to play more difficult passages. On way of doing this is to twist the pick downward. This makes playing from the lowest to the highest strings easier, although it also benefits the picker when playing the other way. The other way to twist the pick is upward. This is the same thing as before, only it is reversed. Now, it is easier to play from the highest to the lowest strings (it slices across the strings in this direction), but it also allows the pick to cut across the strings when moving in the other direction. Finally, there is tilting. A pick can be tilted toward the ground or toward the air. This makes certain types of playing, such as economy picking and sweep picking, easier. The first way to do this is to told the pick down, which makes sweeping from the lower to the higher strings easier. It is also favored by some guitarists to make cross-picking, string-skipping, and even alternate picking easier to execute. Tilting the pick up toward the sky is exactly the same as tilting it down, only everything is reversed. Now it is easier to sweep toward the lower strings, cross pick downward, and skip strings downward. Some players also find this useful for alternate picking in certain hand positions (for instance, they may find it comfortable to do this when alternate picking the low E string). While holding the pick, you have the choice to use either a loose grip or a tight grip. A looser grip will make it easier to execute certain techniques, such as strumming across the full range of the strings. Some players also prefer to hold their pick loosely while performing sweep picking. Alternatively, you can hold the pick tightly. This might make it easier to perform techniques, such as alternate picking, that require a lot of precision. Some players hold their pick either loose or tight all of the time, but many good players alternate between these ways of holding the pick to achieve different ends. In the end, there is no one right way to hold a pick. There are ways that work well for many people, but it is best to find the ways that work well for you. It is also worth noting that you don’t have to limit yourself to one way of holding your pick all of the time. Being versatile and being capable of switching up between ways of holding your pick can make you a better overall player. In the end, that is the goal—to play better guitar. Nevertheless, and regardless of the use of a pick, choosing a great instrument that fits the style you are getting to play has a lot to do with the guitar. You can find more about the guitar that is meant to be for you in our best acoustic guitar and best electric guitar reviews. 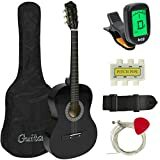 There, you will have a nice guide through what you need to know in order to get the best guitar based on your style, preferences and bucket.